PESHAWAR: Chief of Army Staff (COAS) General Raheel Sharif on Monday morning visited the Army Public School, Peshawar – target of the December 16 attack – as it reopened after an extended winter break, Radio Pakistan reported. The vacations, in schools across the country, were extended for 12 days in the aftermath of the Taliban attack on Army Public School (APS) that killed 150 people in the Peshawar. 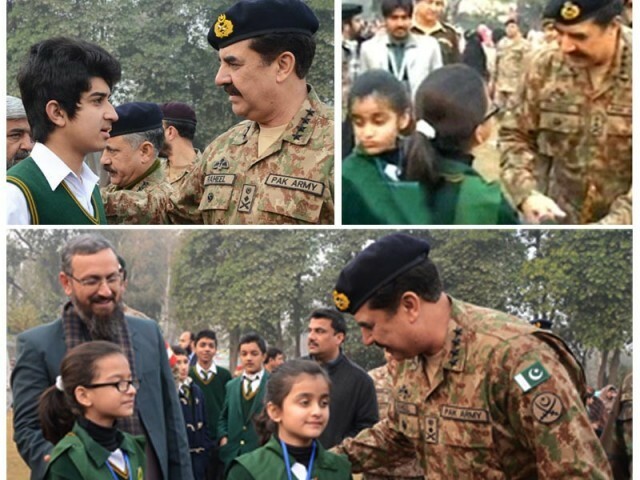 The COAS, along with his wife, met the schoolchildren and their parents at the entrance of the army-run school. DG ISPR Major General Asim Bajwa tweeted about the army chief’s visit. Shahrukh Khan, a teenage victim – shot in both legs – of deadly attack told AFP that he had lost 30 of his friends and that he will have mixed feelings sitting in an empty class. “I have lost 30 of my friends. How will I sit in the empty class, how will I look towards their empty benches?” he told AFP before the school reopened. “My heart has been broken. All the class fellows I had, have died. Now my heart does not want to attend school,” he added. While, another survivor, Zahid Ayub, said he was not scared to attend his school. “I will go and will tell the attackers, we are not afraid of you,” he added. At least 20 soldiers were seen at the main entry point of the APS in the morning, with an airport-style security gate installed at the front. Elevated boundary walls with steel wire fencing were also put in place around Peshawar and in schools throughout the rest of the country. Parents spoke of having to sit down with their children and mentally prepare them for their return to the school, which has undergone a complete renovation to remove all traces of the bloody attack. “He was terrified but we talked him up. We cannot keep him imprisoned between four walls and we must stand against militancy,” Muhammad Zahoor said as he walked his son along the city’s main Warsak Road. “I want to go to school to see my friends. I will join the army after my schooling and will take revenge,” said Muhammad Zaid, his son. Survivors recounted Taliban gunmen moving from room to room hunting for students and teachers. Sometimes the militants toyed with them and pretended they would let them go, before lining them up and shooting them in front of their peers. Punjab Governor Chaudhry Sarwar, during his visit to the college in Lahore, expressed discontent over ineffective security arrangements made in the institution. The governor, as a result, announced a new date for the reopening of the college. Peshawar attack: Maa Kis Ko Jhulaogi Jhoola? Truly a gesture that could come from a family man and a Soldier. Bless you General and your family. Military Training must be mandatory for all Teachers…. Or Teaching training for all Military Men. This is what is called LEADERSHIP! Could i ask Where is Civilian Leadership. Imran, Nawaz , Mr Khattak where are they? Off you go future runners of this nation .May Allah keep you in his safety amen. Stay strong . we have to fight this evil of terrorism together . You education and knowledge will eradicate the evils of darkness . Pakistan Zindabad . Hats off to the Army Chief and his wife for this courageous act. While our Prime Minister and politicians are busy calculating the growth in their sugar mills and industry, our forces are fighting for the nation on all fronts. Long story short… with democratic entities like our politicians, who needs an enemy? Now General Raheel Sharif even has to do what politicians should be doing. These parliamentarians / so-called legislators are only there for the perks and privileges and to have a good time on the expense of tax payers. The heads of the political herds should open a dictionary (although a lot many of them would struggle) and see the meaning of the word ‘leader’ for a reality check. What about the children in Tharparkar who is going to visit them. A great gesture by Army Chief General Raheel Shareef to visit APS today. COAS with his gestures showing that he is close to the people of Pakistan. He will win million of hearts with his actions. Courage of APS students should be appreciated. I wish good luck to all students of APS and hope that they come out of the trauma of loosing their friends soon and get back to normal life. You are such a funny man! KPK regretfully elected a party into power whose CM was very conspicuously absent today from today’s event at APS. Better yet, the “Boss” of this CM very conveniently tweeted from inside his warm blanket that he along with this new soul mate and the CM in question very much planned to welcome the students at APS but were advised at the last moment not to. Funny enough, the top ANP leadership in Peshawar was very much at hand there as if it was given special approval which wasn’t granted to PTI and the CM of the province. The politicians you are trying to belittle made their presence felt with aplomb in the form of ANP. 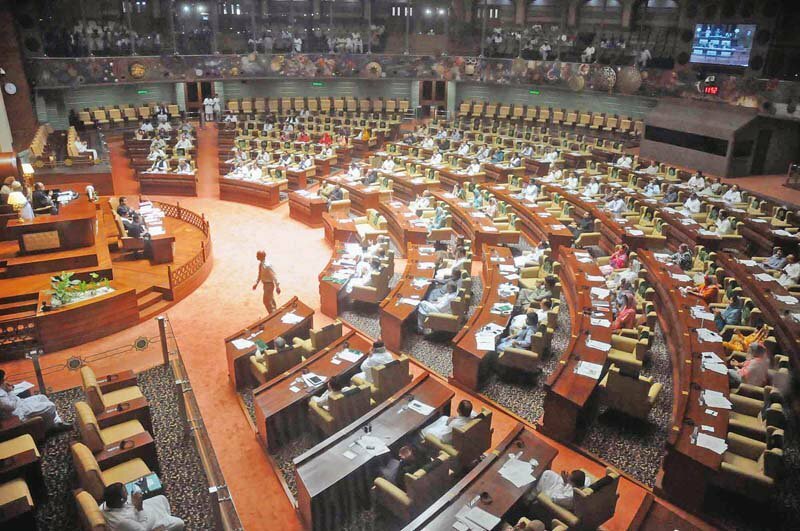 More then anything, where is the Chief Minister and the whole of KPK’s cabinet? Also the decision taken by Governor Punjab is also to be appreciated as it depicts his seriousness towards the safety of precious lives – rather than showing a carefree attitude and asking schools to arrange everything on their own little realizing that the institutions theses days have become so commercialize that expecting much out of them sound funny! @chachoo: IK wanted to go but was told that COAS was visiting today along with his wife. It was too early in the morning for Nawaz Sharif…….the way Imran Khan behaved after the shooting was simply shameful ……… Raheell Sharif has done the right thing……..but let us hope we don’t have an Iftoquar Chaudry in the making. I love Pakistan. Pakistan Zindabad. Was IK also told that since COAS is there today, he should stay away? How come ANP happened to be there? And that what you call ” Leadership “….in stark contrast to our civilian political leadership. These kids should have gone through extensive psychological treatment to overcome such a trauma before they embarked on a new journey….we have no such system in place in our country. We do not learn from other countries who have gone through similar tragedies. @ Shafaq ; Had this been a show of NS, The credentials of the New Principal would have definitely been made public. Maid servant of Marium Nawaz the who was refused travelling in Business Class by the air crew enroute to UK. I grant you full marks about the first sentence of your comment. It was asking too much to make Nawaz get up soooo early in the midday!!! I saw a lot of weapon carrying soldiers providing security to the school. For how many days will this last and will similar security be provided to all school going kids and not just the army kids. This is not the solution, seek and destroy the root cause of terrorism, nothing else will work. Trust me. He might end up being the most respected and popular COAS in our history. Respect and prayers for Raheel Sharif. PM of Pakistan should take some time off from atteedning the board meeting of the sugar miils in which he is investing and offshore visits and visit the school ,even just for media. A true nationalist. While other politicians are busy in corruption & getting married off here is a true leader & son of the soil. Hats off to him. Great gesture by ANP members as well if they were there. I was referring to the ruling party of the nation, especially the PM and his family enterprise. However, nobody inside or outside of Pakistan holds any of the Pakistani political parties in high regards. They’re all the same – inclusive of ANP – one can’t belittle them further. Atleast CM Khattak should be thier and also Imran khan if he is free from Reham khan because they people are responsible for KPK Govt. Standing Ovation to the General. A true Son of the Soil. You have made us all Proud today Sir. This is how a true leader leads his people in crisis. Right from front and everywhere i see him going. From condolences to the family to making new policy for the country. pakistani army zinda bad,our army chief zinda bad. Thousand salutes to the Army Chief and his wife for this considerate act . This is what true leadership is called , his respect in my heart has increased manifolds. Our worthy politicians have just one statement for all the occasions ” we will fight till last terrorist is dead” but their deeds do not reciprocate with their statements, rather it seems as if they are finding means to protect the terrorists. We do not need any enemy with such meaningless politicians as our leaders who protect the interests of the enemies. Please ask your heart do you respect these politicians? . Respect comes from heart after seeing the noble deeds as our great chief has done not just by making baseless statements. Gen Raheel Shairf has again proved that he and Pakistan army are the only ones who are attached to Pakistan. Its a matter of shame for political leadership who talks about democracy and constitution just to keep political interests intact. Had there been no control of Pak army, these politicians must have swallowed whole country. Nobody should mind if a section of our nation praises Generals but praising Generals and disgracing Politicians in one sentence is not only offensive, its dishonest too. It would compel other sections to praise Politicians and disgrace Generals, which (perhaps) our enemies want. Such intellectual dishonesty is our biggest problem. It has resulted in many governments, many armies and many nations in one state which is Pakistan. “Could i ask Where is Civilian Leadership. Imran, Nawaz , Mr Khattak where are they? Stop these stupid, divisive and provocative comments. Military training should also be for All colleges high school level also to defend Pakistan . Islamic history (neutral) be the Part of education and Pakistani history .make the syllabus according to our need rather than the international pressure . @ch daad. Pml n puppet to the rescue..
are civian leader are biz making money and wedding,you think they care about people. The school is run by Army and governance of Province is run by PTI. Stop bringing PM into everything he has other things to do like meeting with important people like John Kerry and working for economic development. What an idead nation….abusing the political leadership and praising an army general…..COAS was performing his duty…thats what he’s been trained for and that’s what he’s being paid for…from our tax money…..No other countries in the world behave or think in such a pathetic manner……we are facing the consequences what the army generals did with this country from the day it came into being till the musharaf era. Even Gen Kiyani was playing double games too while has brother was getting every advantage to become one of the biggest construction contractors in Pakistan. Bringing extremism into this country and changing the educational curriculum to deceive and manipulate the new generation. Everybody talks about business empires of the politicians ….what about the business empires of Pakistan army, Navy and airforce? ?….No country in the world possess armed forces running their own business empires….and that’s why they are called professional armed forces and given the due respect.